Kate's had a baby. You may have heard. 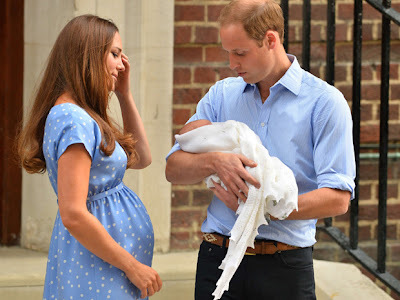 Her Royal Highness the Duchess of Cambridge has been safely delivered of a prince, an eight pound six ounce bundle of royal boyhood, a George no less: and what better name to continue the line of the Hanoverian usurpers? A few grouchy feminists may be disappointed that biology failed to keep up with the times, rendering purely symbolic the efforts of forward-thinking politicians who have exercised such constitutional ingenuity to alter the law of succession so as to cope with a potential daughter. But everyone else has been going positively gooey. Britain's miserable handful of remaining republicans are about as popular now as that women's magazine that helpfully offered Kate tips to lose her baby weight, a suggestion swiftly condemned by Jo "ban airbrushing" Swinson to general applause. Because Kate's had a baby. Hasn't she? True, it has been announced that Kate has had a baby. But it was also claimed that Mary of Modena gave birth to a son by James II in 1688. Many at the time were convinced that she did no such thing: the child was stillborn, and the offspring of a serving woman was smuggled into the birthing chamber in a warming pan. It was to prevent such rumours that subsequent royal births were attended by the Home Secretary until well into the 20th century. But that custom has long since been abolished (Princess Margaret's was the last birth to be so witnessed) leaving the royal succession wide open to gerrymandering. Those redoubtable sceptics over at the David Icke forum have been busy pointing out the holes in the official narrative fed to the the gullible masses. Serious questions, it turns out, surround every aspect of the royal pregnancy and birth. Was the Duchess ever pregnant? Did she lose the baby? Was the child in fact carried by a surrogate and then smuggled in to the Lindo Wing in front of the world's encircling press? The apparent ease with which Kate carried her child, even into the third trimester, raised eyebrows among even mainstream commentators. Sure, she looked pregnant: but she didn't look pregnant enough. "All these women were blooming at six months," declared the Daily Mail on 23rd April, showing readers a SEO-friendly quota of heavily-laden celebs: Denise Van Outen, Holly Willoughby, Dannii Minogue and Heidi Klum. "So why is Kate's bump so tiny?" Indeed, she did look particularly svelte in her stylist mint-green Mulberry coat. Perhaps it was the camera angle. She kept purposely pulling the dress down tight around the bump, and you could see it was rock hard, totally unlike a normal post-partum "jelly-belly". It didn't move at all, jiggle when she walked, etc etc. It was so obviously fake. It was absolutely obvious she had not just given birth, confirmed by their uncomfortable, unconvincing show for the paparazzi where they fluffed their lines and looked shifty as hell. Good actors they ain't - should have hired more talented body doubles. That's what I've been saying - its like jelly after the birth - you still look pregnant but smaller about 7 months for a few days blobbier - not hard and firm and upright - more to the sides than the middle after the birth. 2. Where did that huge baby come from? A weight of 8 1/2 pounds isn't exceptional these days, though it's still well above average. And Kate was widely believed to be several days past her due date when the baby finally made his entrance. But the mother's slimness during pregnancy seemed even more puzzling given such a big bairn. How did it fit inside her? "I saw a baby yesterday while I was shopping yesterday," wrote elshaper, "and I could tell this one was probably about 1 week old or very newborn, still quite wrinkly and red, nothing like Kate's baby which looked like it's been feeding on milk for sometime." Kiwimaj added: "If you check out the way Kate interacts and looks at the baby you can tell and sense that this is not hers and it is all fake. It's a bit like someone holding a doll and pretending it's a real baby!" William's behaviour attracted suspiction, too, particularly his words addressed to journalists wanting a clue as to the name: "Well, it's the first time we've seen him really so we need to catch up." Just the sort of thing that might slip out if an unknown child had been slipped into your arms in the hospital lobby. But does all this mean that Kate can't have been pregnant? As Yass, pointed out, "if the Royals are really reptilians then it all might be a different ball game when it comes to birth." Perhaps there never was a pregnancy. The US gossip magazine In Touch ran a splash in 2011 titled "Will and Kate's baby heartbreak", citing mysterious "health complications from Kate's adolescence" that might affect her ability to conceive. The speculation, supposedly, came straight from the horse's mouth, as it were: step mother-in-law Camilla had "blabbed to friends" about the problem. Then late last year another US tabloid, Globe, claimed that Kate was undergoing fertility treatment and was "determined to be a mom by next year". The story appeared on November 23rd, by which time she Kate was already at least a month with child. At least, so we have been led to believe. Less than a fortnight later, in fact, Kate was rushed to hospital suffering from severe morning sickness, the intensity of which led to a bout of excited speculation that she might be expecting twins (remember that?) But was this just a cover story? Elshaper's theory is that Kate had miscarried "due to vigorous physical activity" and that as the doctors hadn't been able to save the baby, a "substitute had to be brought in" - in other words, a surrogate. Perhaps, adds actionplan, the real baby hasn't actually been born yet, the surrogate is still pregnant, and Kate is going to her parents for six weeks to keep her cover. The baby we saw on the steps of the hospital was merely a stand-in, a baby procured at short notice (after all, it is a maternity hospital) to satisfy an expectant world. Support for this theory comes from the apparent suicide of nurse Jacintha Saldanha, supposedly upset after taking a call from a couple of Aussie DJs. We all know that the secret services can fake a death. Perhaps, thinks actionplan, Saldanha "saw something she shouldn't" and had to be silenced. Perhaps a surrogate delivery had been planned all the time, and Kate's supposed morning sickness was a cover for what was actually going on: her eggs being extracted for fertilisation and implantation in a surrogate. Or perhaps the royals were making the best of a bad job. Either way, the pretence of a pregnancy had to be (however unconvincingly) sustained for eight months while somewhere, far from prying eyes, a surrogate mother was, and possibly still is, carrying the penultimate heir to the throne. How she was recruited is unclear. One possibility is that she is herself a member of the Illumanti bloodline to whose existence David Icke has spent so much effort alerting the world over the past twenty years. No doubt her silence has been bought; though one does worry what will happen to her after she has fulfilled her purpose. They're a ruthless lot, these reptilian shapeshifters. To be fair, some people on that thread pointed out the absurdity of the conspiracy theories being offered. One offered her own experience of motherhood to show that Kate's appearance during and after her pregnancy was far from abnormal: "I don't see anything unusual about her belly and I've been there so I should know." There's sense to be found even on the David Icke Forum, even if those contributors putting forward the conspiracy theories were determined that nothing would make them take the world at face value like the general run of sheeple. But suspicion of the royal birth may be more widespread than you think. I managed to spark off a conversation of Twitter this morning on the subject. As one person sympathetic to the conspiracy theory commented, "it's almost too bizarre to get your head around! But I KNOW life can be weirder than fiction..."
If you think all this is mad, remember that in 1688 the circulation of a no less crazy conspiracy theory led to a revolution, ousted a dynasty and changed the course of British, and world, history.